Mostly I read fiction, because I like a story to pull me through a book, like gliding through the water without actually swimming or rowing. But, every so often, I read nonfiction, just to be challenged; this usually means I have to slog through on my own steam. Not necessarily a bad thing to do, while reading, just difficult. Also, by the way--embarrassing confession follows--I almost never, ever buy books. I read too many, and I just don't have the space or the money to purchase all those books. Every so often, however, I make an exception, and instead of borrowing from the library, I reward the author by actually paying for a book. 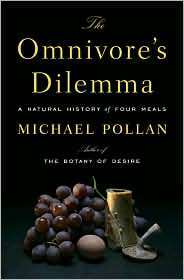 Thus, I bought The Omnivore's Dilemma: A Natural History of Four Meals, by Michael Pollan. 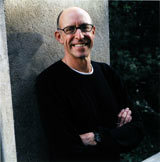 It's a beautifully written, intriguing account of the American food chain. I know it doesn't sound all that interesting, but trust me, if you eat, then you need to read this book. If you're like me, you've known for a while that beef and chicken are fed too many antibiotics, and there's fishy stuff going on with the fish in grocery stores. Well, guess what? The situation is worse than you can imagine. I've only just begun the book, but Pollan's thesis is that our entire food supply is based on two items: corn and soybeans, all produced in vast quantities and then processed to become hundreds of other food products. We are NOT talking corn on the cob or corn flakes, either. We're talking number 2 corn--10 billion bushels a year of the stuff, what Pollan calls "a great golden river." The corn is mechanically separated and transformed "into its chemical parts": corn oil, gluten, constarch, glucose, corn syrup, dextrose, fructose, adhesives, coatings, stabilizers, thickeners, gels, maltodextrin, maltose, ethanol, amino acids, and other stuff used to manufacture plastic. American farmers have become adept at growing this stuff at a rock bottom price, partly by using genetically modified seeds, and partly by drowning the soil in nitrogen so concentrated that it pollutes the water supply, and ends up in rivers and oceans, destroying all forms of aquatic life. It's so cheap that we've engineered cattle into eating it instead of grass, which is what they were designed by nature to eat. But it makes them sick, so they need antibiotics so they won't explode die from eating the wrong food. Cows fed corn grow faster, which means they are cheaper to produce, and can be slaughtered before they die from their unnatural diet, which will eventually kill them. So much of the beef and chicken and pork we eat, as well as every other kind of processed food, contains corn, that our cells have become cornified. Really. Scientists examine hair for certain corn-related isotopes, and it turns out that "we North Americans look like corn chips with legs." Or, as Pollan puts it: "So that's us: processed corn, walking." The book is much more eloquent, and convincing. It also makes me want to move to, say, Costa Rica, or someplace where the food is just food. Also, it makes me wish I could write this like. Anyway, read this. Just not while you're hungry. I return from my whirlwind speaking tour tomorrow. Check here for an update on what it's like to lead workshops for real live empty nest parents on Parent's Weekend!